And happy birthday to International Mastermind! So what's creepier . . . gnomes or leprechauns? GNOMES!!! definetly creepier. although, i'd be much more scared of a pixie that lost it's temper. they can be down right nasty.leperchauns... i dont know. i suppose they can both be mishchievious, but gnomes are like stalking little old men. creepy. 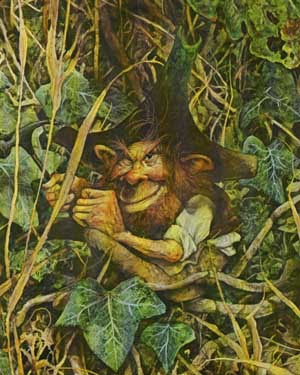 In my mind, neither gnomes or leprechauns are very creepy........ but if you actually met one is a whole other story. Happy Birthday Internation Mastermind! (even though I said it about a million times today) Happy Saint Patrick's Day too everybody. I say gnomes are creepier. Leperchauns can be kind of cute even though they are trouble makers. And ever since Ananka posted about that stalking gnome I have not been totally freaked out! Leperchauns don't stalk people, or do they? As for dressing up, as I said, I was wearing a wolf costume to be in the third showing of the Jungle Book. Sffh was a monkey! I think leprechauns are pretty darn cool. Especially the ones in Artemis Fowle. A friend of mine was wearing giant plastic sunglasses shaped like shamrocks today. Today is my namesday! Even though I'm not really named after St. Patrick... Still. Lepracons. Uh, I mean, little guys in green suits soming around to give you good luck or bad luck, and talkig in an Iris accent. Creepy. -I'm getting more and more lazy about signing in. Artemis Fowl LEPrecons and the fabled leprechauns are very different prototypes. But, yes, the AF ones are WICKEDLY AWESOME!!!!!!! Yay! they're both wierd. chickens are nice. Gnomes - the leperchauns give you money - or is it skittles? Follow the rainbow!!!! happy late birthday international mastermind!!! I think gnomes are the worst. gnomes. i read this one harry potter with crazy gnomes...scary.